Previous image, 83 total items. Next image, 83 total items. Expedia has some top notch London holiday packages. Bundling your bookings is a surefire way to save time and cash — and get your trip off to a great start. If you book a package deal on Expedia, you can save as much as $200*. Our comprehensive database provides more than 400 partner airlines and 321 000 worldwide properties. With such a broad range of options, you can't go wrong! Almost all accommodations can be changed without any additional fees from us. Itinerary need a little work? London holiday all arranged but no idea what's on the cards when you arrive? Let us give you a helping hand. Take it from us, your bucket list will be a whole lot shorter by the time you're done with London! 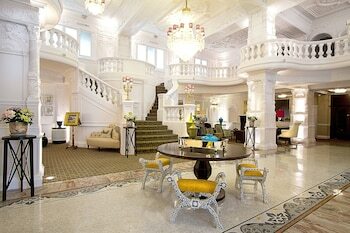 World-renowned attractions like the Big Ben and Buckingham Palace ought to be your first ports of call. Royal Albert Hall and Trafalgar Square also lure in scores of adventurers from all corners of the earth. Home to wonders such as the Coca-Cola London Eye and Westminster Abbey, there will never be a boring moment in this metropolis. When you're done looking around those, move on to the Tate Modern and Kensington Palace. Used as a house of worship and private prayer, St. Paul's Cathedral is a renowned structure. That being said, you don't need to be a faithful church-goer to explore this serene place. Adventurers in this destination have heaps of options. Take a walk around the age-old chambers, halls and corridors of Tower of London. This impressive structure provides an educational outing for young and old. Still have some time on your hands? Theatre challenges our way of thinking and asks us to aspire to higher things. See a production at Globe Theatre and open your mind to some big ideas. You don't have to stay in 5-star hotels or fly business class to have an amazing holiday. Just get stuck into all the extraordinary things you can do while you're there! To view a comprehensive list of activities, head to our London things to do page. 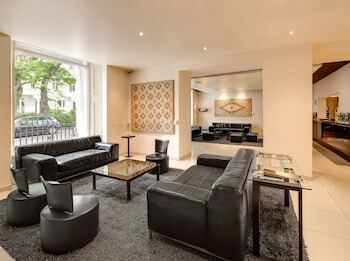 Travelling to London for your next luxury getaway or cheap holiday? With as many as 1,554 properties to select from in the national capital, securing a room will be easy. 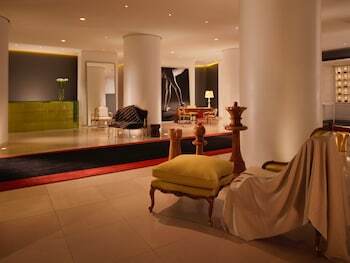 The Bulgari Hotel, London (171 Knightsbridge) and the 47 Park Street - Grand Residences by Marriott (47 Park Street) are two of the higher-quality options in London. 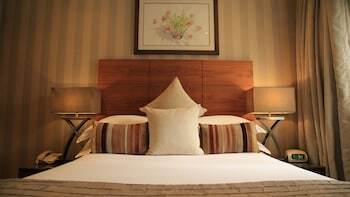 Book a room at either and you're bound to have some of the best amenities in town. 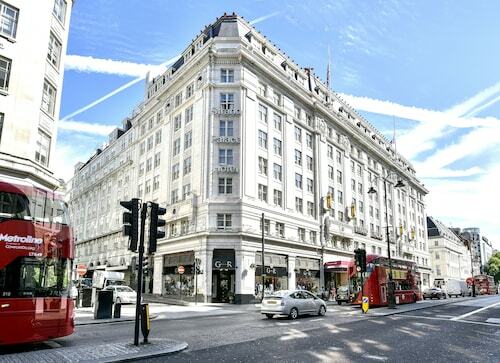 If you're hoping to find somewhere that doesn't break the bank, the Crowne Plaza London - Kensington (100 Cromwell Road) or the City Courtyard Apartments & Penthouse (253 Commercial Road) could better suit your requirements. No stay in London would be truly complete without stopping off at the Big Ben. 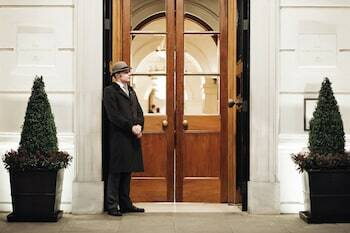 The Corinthia Hotel London and the Haymarket Hotel, Firmdale Hotels are both good options. Heathrow Airport (LHR) can be found 14 miles (23 km) west of the heart of London. Claim your luggage, call for a taxi and get your holiday started! Arguably one of London’s most famous monuments, this prominent landmark is a national icon, adored by generations of Britons. This luxury residence of the oldest royal family in the world is still a national icon, attracting thousands of visitors each year. For the best views of the London cityscape, climb aboard this impressive observation wheel and view the great British capital in all its glory. Lose yourself in the maze of boutiques and bars or pull up a chair and watch the numerous street performers work their magic in this entertaining district. A fantastic reference point for locals and visitors, this bustling square is home to one of the nation’s most treasured monuments. This bustling, energetic area of London has been likened to Times Square in the US. 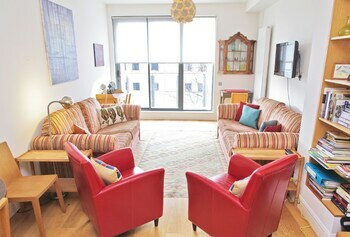 It's also the perfect place to start your London sightseeing adventure. A marvel of engineering, this iconic landmark has for centuries been at the forefront of London’s epic skyline. The true soul of London’s beating heart, this magnificent gothic cathedral is at the centre national occasions. One of the world’s most prestigious concert venues, this stunning 19th century tribute to Prince Albert is one of London’s most adored architectural treasures. This wide open green space is a perfect location for relaxing amid the backdrop of Royal luxury and pomp. Visit Britain’s most prestigious art gallery, housed in an abandoned power station on the banks of the River Thames. This colossal treasure chest houses some of the world’s most precious artefacts. Today, it is one of the largest and most comprehensive museums in the world. Browse hundreds of reputable shops, cafés and restaurants in one of the busiest shopping streets in Europe. Shop, dine and drink at this pedestrian-only street made famous the world over by musicians and socialites during the Swinging London era of the 1960s. Spend an afternoon discovering this famous shopping street, home to the world’s oldest toy shop and high-end boutiques. Old-world lanterns and tributes to Blake and Shakespeare add a literary layer to this green knoll, which has one of London’s six protected viewpoints. Check out old posters and maps, see models of London’s 19th-century transport systems and watch your kids guide a Tube train through a simulator. One of the largest bronze sculptures in Europe tops a victory arch marking the battle that ended the Napoleonic Wars. Venture inside for exhibits and views. Bring your family to the adjacent gardens and playground of this Gothic masterpiece that plays a key role in the U.K.’s parliamentary history. Marvel at the graceful movements of the ballerinas on stage and hear the sweet music of the orchestra in a theater that has been popular since the 1700s. 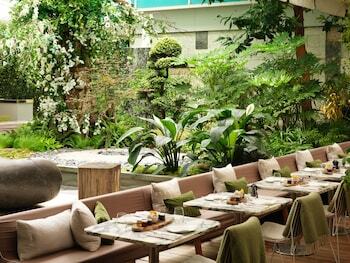 This affluent area is home to some of London’s most exclusive shops, as well as a regal palace and gardens. Come to this street to see how traditional Bengali groups share the spotlight with the hipsters, trendsetters and fashion models of London. Peruse the jewelry, designer brands and antiques on display in the upscale boutiques and elegant arcades of London’s prime shopping street. Shop until you drop, sample food from around the world and attend live music events at the colorful markets of Camden Town. Experience the creatively charged atmosphere of Camden Town as you walk along this street packed with bars, restaurants, markets and music venues. Get tips from traders and browse the artisanal food and healthy smoothies packing the stalls of this London stalwart that dates back more than 1,000 years. The founder of Harvard University was baptized in this oldest Gothic church in London. Marvel at its stained glass and opulent chapels. From antiques, arts and crafts sellers to a superb food court and live music, this market buzzes with energy 7 days a week. Relive the lives of children through the ages via collections of toys, games and puppets at this quirky museum. Enjoy views of the boats in this dockland area while visiting one of the tallest structures in the U.K.’s capital city. Marvel at symbolic and cultural carvings adorning the façade and halls of this neo-Gothic masterpiece and browse eclectic art exhibitions. Investigate the decks and hull of this handsome 19th-century wooden sailing ship, the last remaining tea clipper in the world. Browse collections of historic monetary artifacts as you take an educational journey through the 300-year-old history of the Bank of England. Glean fascinating insights into the U.K.’s naval heritage when you tour this Royal Navy cruiser, which saw action in World War II. Rise above the hustle and bustle of London’s streets and join flamingos and other birds in these tranquil themed roof gardens. Climb 311 spiral steps to see the views from the top of this memorial, which is dedicated to the devastating Great Fire of London. See life-size wax sculptures of Hollywood celebrities, historical figures and sporting stars at this famous wax museum in London. Known for its association with a well-known nursery rhyme, this iconic bridge has existed in various forms for more than 2,000 years. Spot the former homes of Winston Churchill, Harry Gordon Selfridge and fictional character Bertie Wooster in this affluent plaza containing some of the city’s oldest trees. One of London’s largest parks was once a royal hunting ground and is now a popular place to enjoy pretty flower displays, live music and superb city views. Follow in the aristocratic footsteps of the Chelsea elite, with a trip to the historic theater and swanky department stores surrounding this tree-lined square. Explore the wonders of the natural world for free in this fascinating museum. Learn about dinosaurs, creatures of the deep, our planet’s interior and much more. This historic market is an explosion of color, from brightly painted houses to displays of antiques and garments among more than 1,000 stalls. Marvel at the sanctuary of foliage and colorful flowers and barter with the vendors in this lively and historic market. Browse upscale items in independent stores and people-watch from a café in this historic and fashion-conscious part of the city. Enjoy a few drinks on a pub terrace overlooking the river next to one of London’s oldest working river crossings. Jousting, archery and cricket are woven into the rich history of this active park, enclosed by some of Richmond’s most historic buildings. Browse the elegant fronts of the luxury retail stores and learn the history of the city’s oldest purpose-built commercial gallery. Admire the charming two-story shops that flank this roofed colonnade, known for its silver antiques, designer brands and delicious macarons. Learn about the fictional detective at one of the world’s most famous addresses and admire the period décor from the 19th century. Discover the role of the Household Cavalry, a mounted and prestigious regiment of the British Army that acts as the bodyguard of the Royal Family. Sail on the water or walk along the riverbank to admire the scenery and take a trip through time on London’s great river. Marvel at the otherworldly design of this space-age tower that plays a key role in finance, international risk management and insurance. 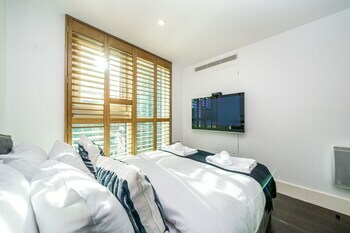 Located in London City Centre, this eco-friendly hotel is within a 15-minute walk of Covent Garden Market and Piccadilly Circus. London Dungeon and Big Ben are also within 1 mi (2 km). Charing Cross Underground Station is 5 minutes by foot and Covent Garden Underground Station is 6 minutes. 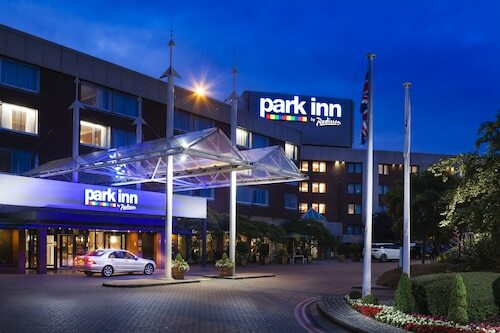 Located in Hillingdon, this hotel is 2.8 mi (4.4 km) from Stockley Park and within 6 mi (10 km) of Brunel University and London Motor Museum. Windsor Castle and Thorpe Park are also within 9 mi (15 km). 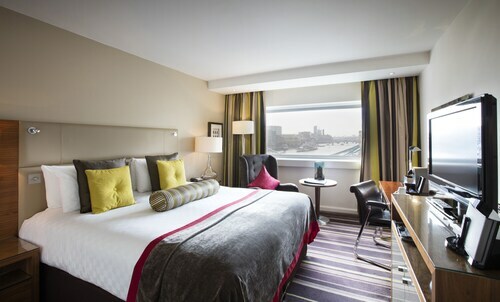 Located in London City Centre, this hotel is within a 10-minute walk of The Vaults, Imperial War Museum, and Florence Nightingale Museum. Old Vic and Southbank Centre Book Market are also within 10 minutes. Lambeth North Underground Station is only a 2-minute walk and London Waterloo Station is 9 minutes. Thu., 21 Nov. - Sun., 24 Nov. Mon., 18 Nov. - Sun., 1 Dec. Sat., 2 Nov. - Tue., 19 Nov. Sat., 19 Oct. - Thu., 14 Nov.
Wed., 6 Nov. - Tue., 26 Nov. Sun., 19 May - Sun., 9 Jun. 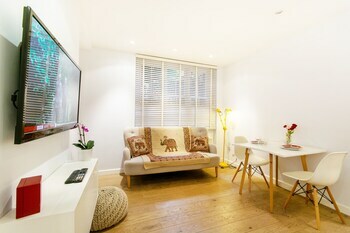 Looking for Flights, Hotels, Car Hire and Holiday Rentals in London?